Actually, it has been two weeks and a day since the surgery. Here's the deal: The part of my face where the actual main part of the tumor was is smaller, but other parts are larger. It all just looks strange to me, watching my face change shape by the day. 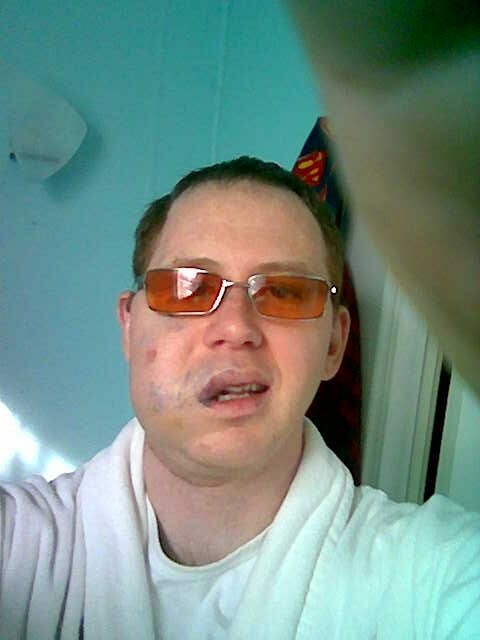 I think I look worse right now than I did prior to the surgery, mainly because I'm still so swollen around my mouth that it sort of just hangs down in the corner. My neck is still swollen too, though significantly less than before, and that side of my face in general is swollen. Two weeks...I thought I'd be further along than this. It is frustrating as all hell. My mouth may actually take longer than the six weeks because at some point in there, there is still some of the fluid that is supposed to harden and dissolve the vascular stuff we don't want. And after all these years, it will probably be lopsided, requiring some additional cosmetic surgery (at which time I may just have to see about getting a few other things done too!). I did, however, shave off the beard yesterday. My mom asked me why because she wanted to see it, and I told her I did not go through probably $100k worth of surgery to heal up and end up looking like my Uncle Kevin! So, for those of you out there thinking after hearing me say they got everything that I must look normal by now, I don't, and here is the pictoral proof. Why the shades? Because whenever anyone takes my picture, including me with the camera phone, my eyes go all wonky and I look insane. I got tired of discarding pics...I hate photos, and imagine I probably will continue to even after I heal totally. At this point, I am beyond giving a damn what people think of how I look post surgery. Seeing someone swollen and then seeing the gigantic incision on the neck and face is understandably a bit disturbing, but I have cabin fever something fierce and have to go take care of business. I called my doc's office on Friday morning begging them to let me return to work on Monday, but they never called me back. We'll see what I look like on Tuesday when Craiggers and I hit Napa River Grill for our anniversary dinner (5 years! )...I hope I can get a tie around my neck! Meanwhile, the infamous Dirty Debbey is coming over tonight for some wine and dishing. I am so excited to have company that I might actually put on clothes other than pajama pants and a bathrobe! I was supposed to drive to Grayson today for my nephew Caleb's birthday party, but I just don't quite have the energy for a roundtrip car ride of six hours. In other news, I received small scholarships from UK and UofL. I've decided to take the UofL offer, though after sitting down and doing a serious evaluation of my finances, I've realized that I'm going to have to borrow $24k per year at least in order to pay the rest of tuition and to live. I am, needless to say, scared out of my mind at both borrowing that much money and of living on that little. Not as scared as I am by, say, Teri Hatcher in any red carpet event, but still quite scared nonetheless.